Awaken to white sand beaches set against the backdrop of emerald and turquoise waters without even leaving your bed! 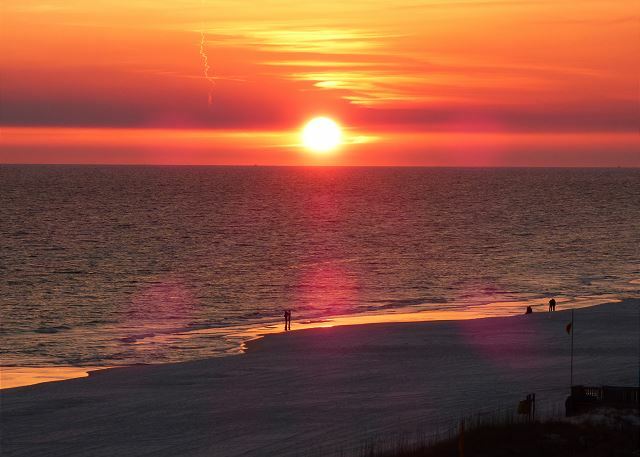 This 2BR/2BA beachfront condo offers spectacular sunset views of The Gulf of Mexico from the master bedroom as well as from living/dining/kitchen area. The well appointed interior is warm & inviting setting the tone for a memorable vacation. Upgrades include Flat Screen TVs & Keurig Coffeemaker. Beachside II offers free Wi-fi plus there is small fitness area on the first floor. Nicely furnished and equipped unit. Nicely appointed condo. Rather small but great for 2-4 people. We usually cook in and would have preferred updated cookware, etc. Brand new appliances were nice. Furniture nice, comfy but crowded seating. Great water pressure in showers unusual for condos. Simple things, important to us. Downside was Red Tide and Hurricane Michael bearing down. I’d rent here again. Management was very good. Lovely,clean condo with a great location and beautiful view. I have stayed at this condo before and would book again. My family and I enjoyed our stay. The proximity to the beach was perfect. The unit came equipped with chairs and toys, making beach time all the better. The unit was clean and well appointed. Great view from the balcony. The only issue was the hot water was not working well in back bathroom. Other than that, we had a great time. This place was everything that I was looking for. Great view!!! Awesome location!!! Super clean, nicely furnished and well equipped. Wonderful on beach location. 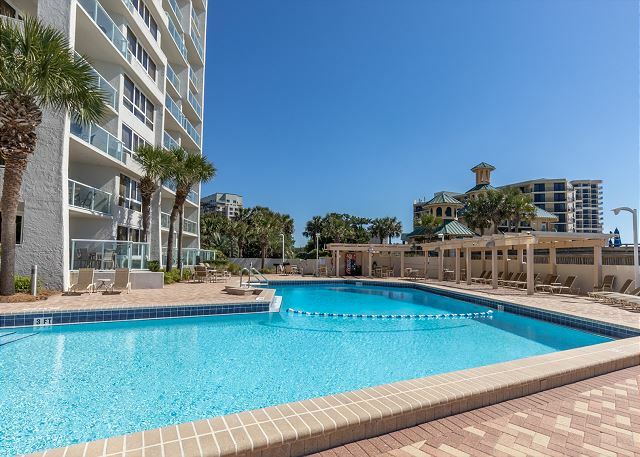 Gorgeous well maintained unit right on the water. Perfect for my family. Had everything we could need for our 5 night stay. We would definitely stay here again. Everything listed was accurate, fully stocked. Unit was clean and cared for. Manager is super responsive. I would recommend this unit to friends. We enjoyed our stay in this unit. 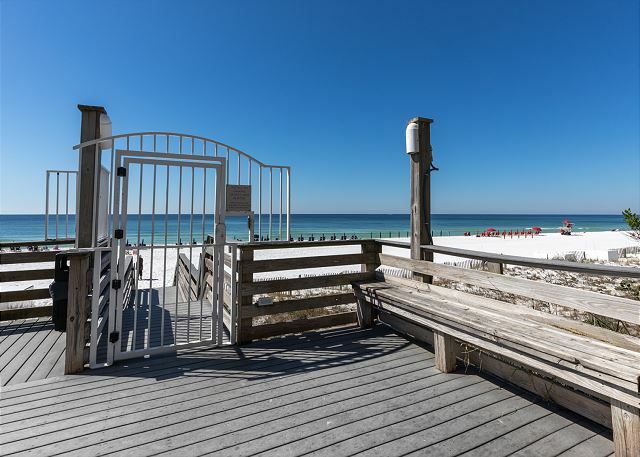 The location, beach access, view and pool were just what we wanted. Everything went well for us (except for rain). The unit needs new furniture and was not quite ready for small children. we put everything up and returned it to it's spot as we left. We can control alot of things, but not rain. I have not had anyone comment about the furniture as the living room couch is only 5 months old. I suspect rain tends to affect how you see things. Spent a long weekend with our former exchange student daughter and her family. We all loved the facilities, the condo, and the view. First things first - the view! Wonderful view of the Gulf and beach. Can't say enough about waking up every day to waves rolling onto the beach. Just spectacular! The unit itself was very nice. We had no complaints. We felt like we were at home. 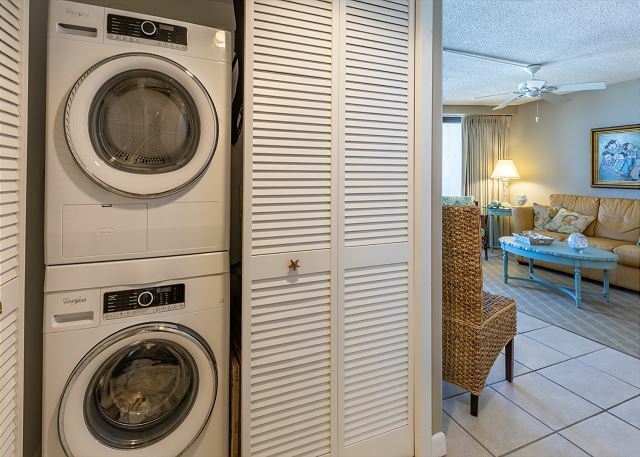 The main property was very clean, well-kept, and safe. Best property that we have visited so far! The beach - what can you say? 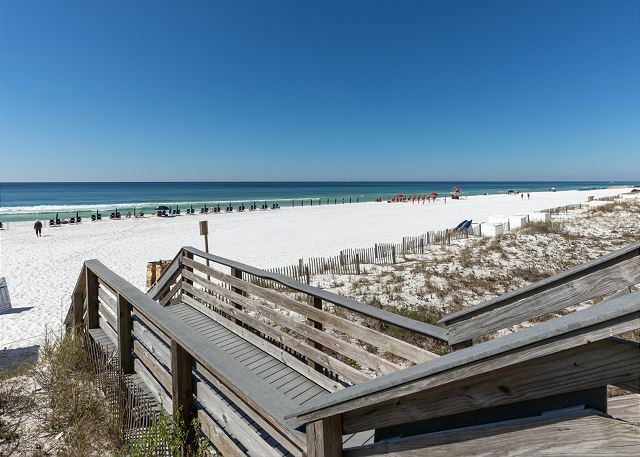 Clean, beautiful sand, and lots of activities to do. I also have to give a shout out to Denise, the property manager. She was so responsive to us after we had a failed reservation at another property. Returned our calls very quickly, scrambled to help us secure this unit quickly, and was just plain awesome! On-site maintenance contact was just as responsive and courteous. Wonderful vacation! Our experience was very good. A lovely condo. We stayed in unit 4263 and absolutely loved it. The unit was very clean and the views were amazing. Denise was our booking agent, and she was most helpful in every single way. We will be using her again. Great customer service! Beautiful unit, great views and a professional management team. We had a wonderful vacation. We found the unit ready and clean upon our arrival. The unit is tastefully decorated and was stocked with everything we needed. The Keurig was a big plus for us! 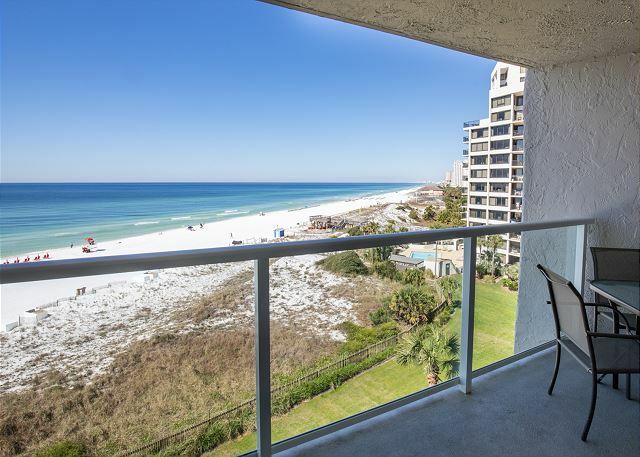 The unit has a beautiful view of the gulf and a nice sized patio with table and chairs. 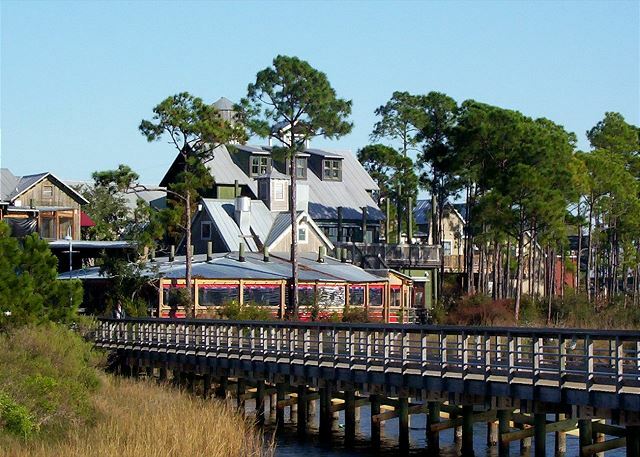 We had teenagers with us and the combination of the beach, pool and Baytowne activities gave ample choices to keep everyone happy and busy. The tram to Baytowne picks up every thirty minutes right at the front door which was very convenient. There is a large ice machine on the first floor for filling coolers before heading to the beach. Grocery stores, restaurants and other activities such as the water park are all moments away. Great location! We rented beach chairs but noticed there were lots of chairs and an umbrella in the unit. The management team was so professional and quick to respond throughout the entire process which made us feel at ease should any issues arrive. However, we did not experience any issues. We couldn't ask for a better vacation and would not hesitate to rent this unit again or to recommend to others. 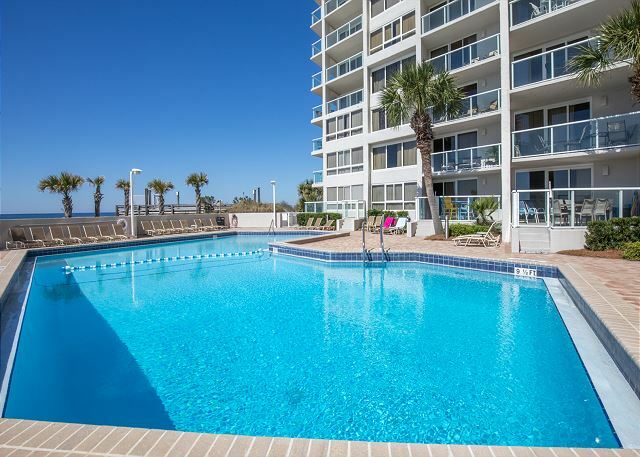 We go to Beachside II virtually every year, stay in the same condominium and have done so for years. That should tell you all you need to know, because my wife is soooo picky. So, if she is content, you will be as well.